And, here it is! The new house. Rob and Patsy are going in for the first time after it became ours! It is on .3 acres. It has a large garden area with Marion berries on one side and raspberries on the other. 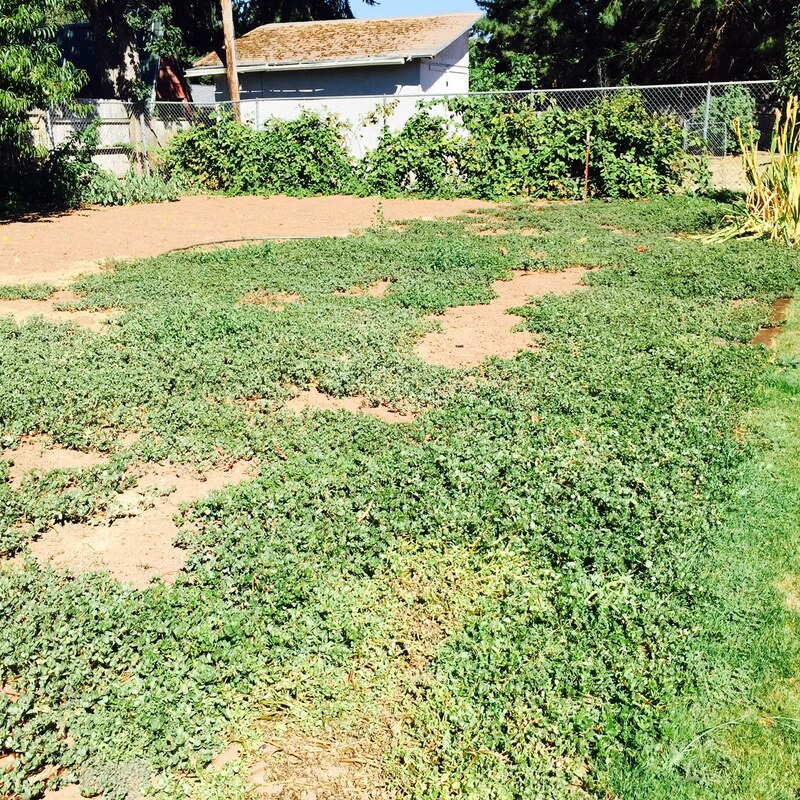 Clearly, there are a lot of weeds to remove, but it has grown the former owner a good garden for years, and the soil has been amended. And a cute little partially enclosed patio. 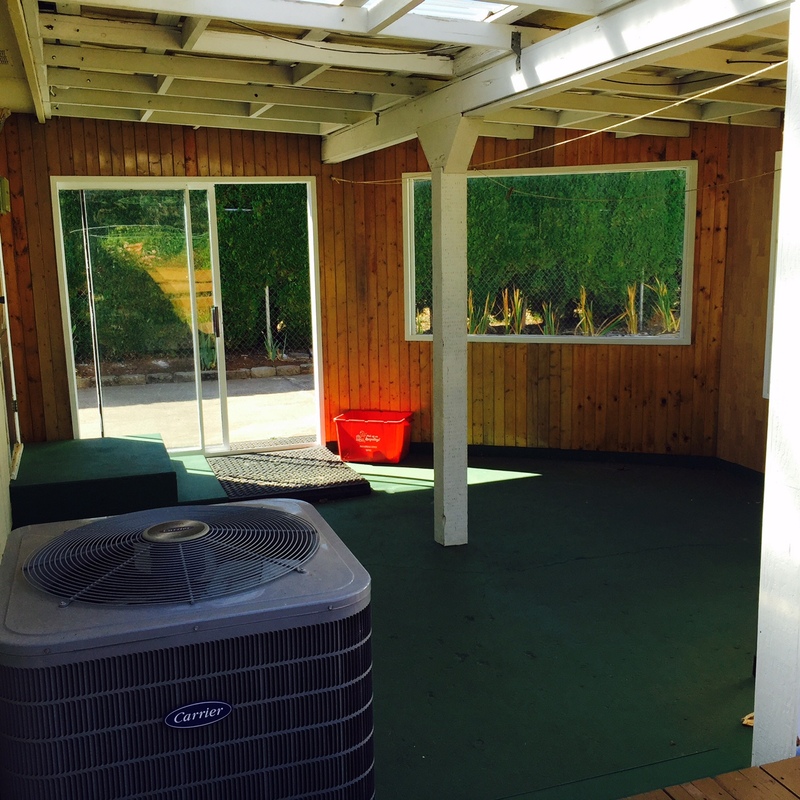 Behind the patio is a paved area where the camper can be parked behind a locked chain link fence. 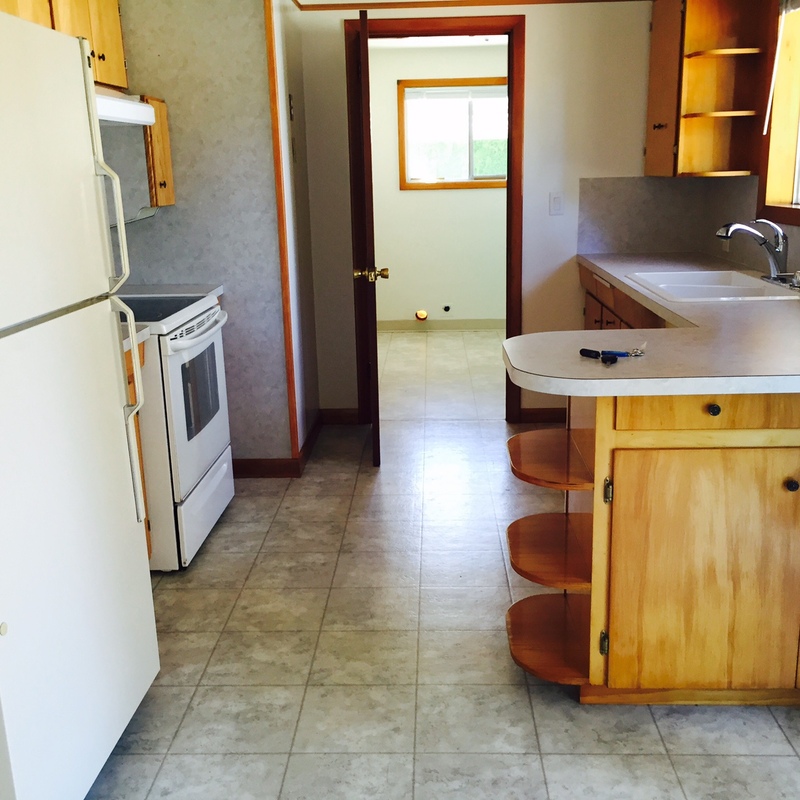 Here is the kitchen and the laundry room behind. The living room has a fireplace. The carpets smelled badly of cigarette smoke. Our first project was removing them. After 2 days spent pulling up carpet tacking strips, pulling carpet staples as well as the carpet and pads, the lovely hardwood was revealed. We have an appointment scheduled to get them refinished. We are super excited and can’t wait to start living here! I will admit that I have muscles I never knew existed after crawling around on the floor for 2 days. I am very happy that I’ve leaned a new skill, though. I’ll bet there are several new experiences ahead! Oh Becky, what a beautiful house you’ve purchased! I’m so excited for you and your family. By the way, I’ve been waiting on edge for you to share these pictures!!! Thank you so much for posting them. I know exactly what you mean about the muscles. I’ve pulled up carpeting before as well. The hardwood floors look like they are in pretty good shape, too. You could almost give them a good cleaning, wax and polish, instead of refinishing them. Can’t wait to see what else you do before moving in! There are gouges in the floor from the carpet stretcher, as well as tacks and nails. I think they are going to fill those, sand it and make it smooth. Much better for bare feet! I’m excited. Woohoo!! Why on earth did they cover those floors?! They look great now! The enclosed patio will be so nice! You are going to be busy, but busy is good (IMO). Just don’t try to do everything at once. I’m so glad you have your own place again! Yes! I can’t wait to move in, but patience….. I love the floors, too. What a nice house, Becky! And three acres! I’m so happy for you. Those floors look great. We’ve refinished floors before and where the carpet tacks made holes, disappeared when we refinish them. Should be pretty! Congratulations again! Andrea–I’m glad you told me about your blog. I spent quite a bit of time trying to find it the other day, and decided I might be going crazy:) I hope you enjoy your hiatus form blogging and good luck house hunting! That’s one job I’m glad to be done with. I am soooo excited for you guys. The house is so cute and looks like it is perfect for your many of your needs. Your future garden will be great, a home for the RV, and lots of customization already started. Pace yourself but keep the pictures coming. I will:) It was hard to find, but I think it will suit us. Congratulations!! Your carpet pulling story brought a big smile to my face. 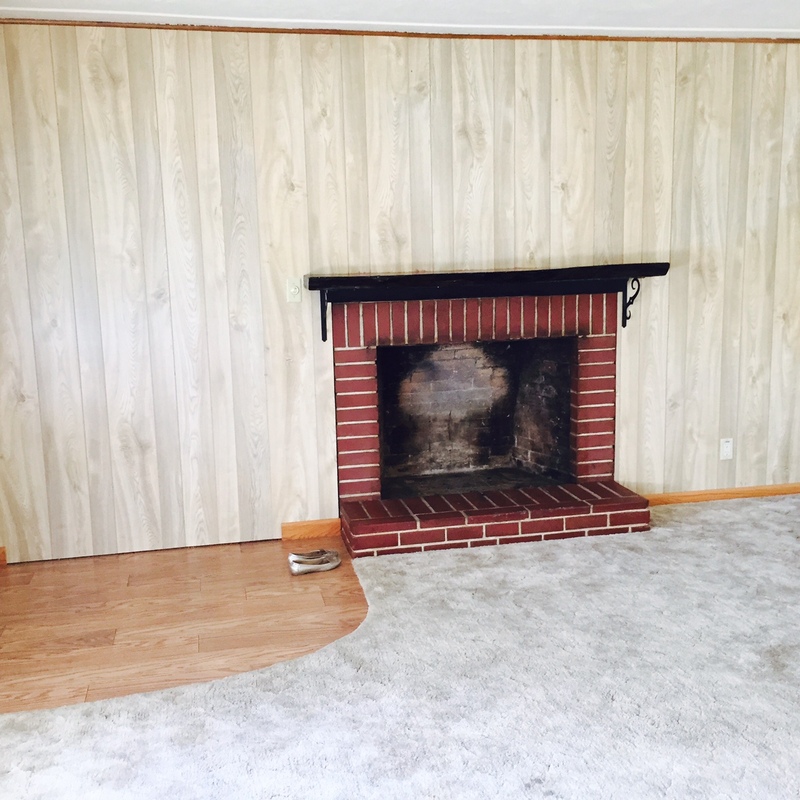 My first house in Seattle had horrible stained and smelly carpets on the first floor. 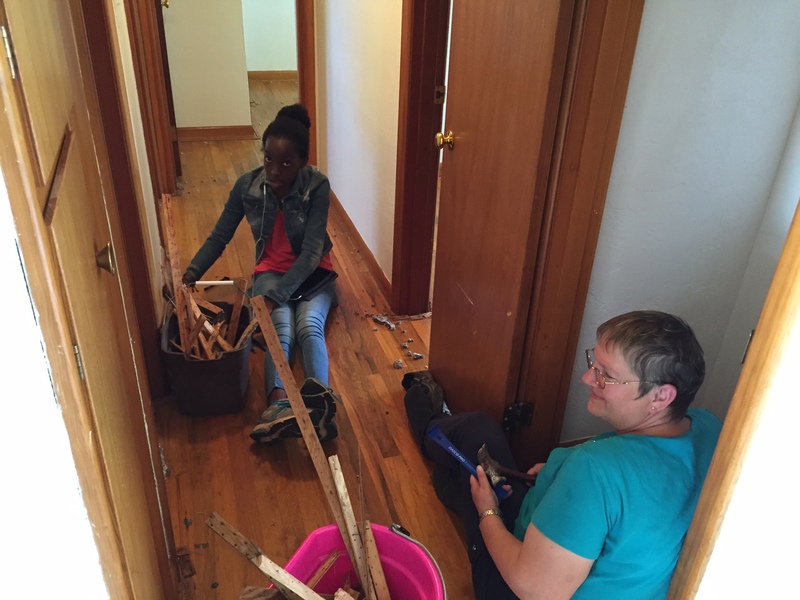 Two friends helped us one day to pull carpet and the awful nailing strips and staples from the floor. But the funniest part was that all FOUR of us worked our way into the exact same corner of the living room without realizing it until we were on top of each other. Too funny. Our solution was to use Murphy Oil soap and call it good for years. We had so much else to do that refinishing the floor was delayed a long time. You’re smart to get that done before you move in. 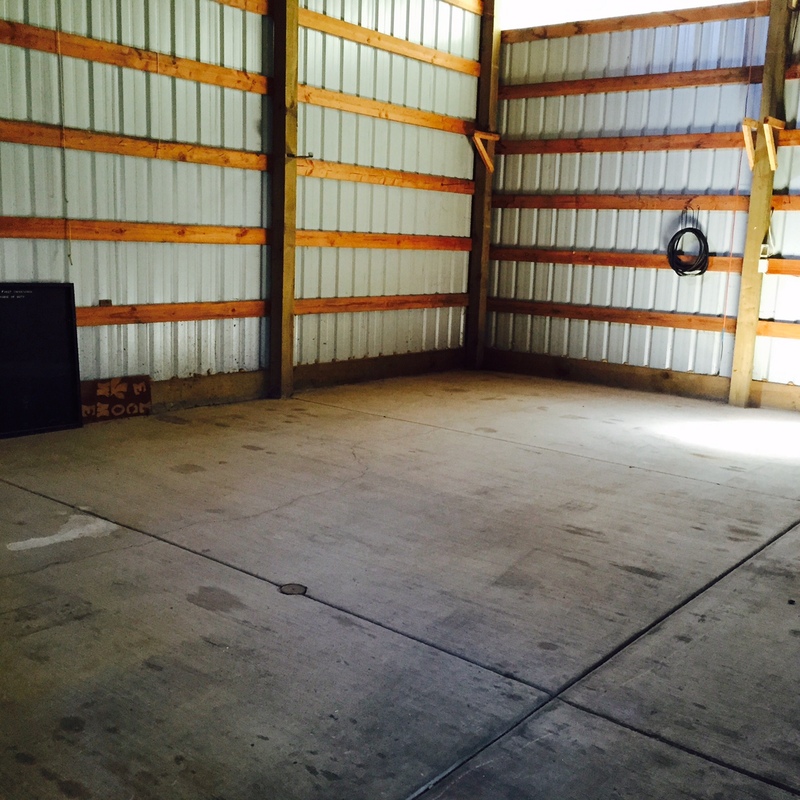 SJ–It’s .3 acres–1/3 acre—:) Sorry if it came through the other way. Still, a nice big lot. I’m glad we can get it done before we move in and it should last for years! What a lovely home….best wishes! Congratulations! Your new home is lovely, and it looks like you’ve got a good spot for a garden 🙂 . Enjoy the process of making it yours! Thank you! the garden excites me a lot!! Congratulations! Your new house looks so nice! I had to convert on Google to know how many meters is .3 acres and it’s over 1200 mts, it’s a good size for a yard, I think. I grew up in a similar space and it was possible to grow so many things there. I wish I had such space right now that I am so interesting in gardening. I’m looking forward seeing your garden updates 🙂 Many blessings to you and your beautiful family! Thank you so much! I am so excited that it’s hard to wait to move in, but I know I will want the floors done correctly first:) This morning, Lovana and I worked in the garden here at my sister’s house, where our camper is parked for now. So, I still need to work on this garden sometimes and get to harvest from it, which is nice. Once fall comes, it will frost and plants will not grow anymore in our climate so I will start a garden in our new home in the spring. Just read on prudent homemaker you were thinking of where to put your sewing stuff, well we turned our two little closets in our 1158 sq ft rancher into a spot for plants, and the other a desk area by ripping the doors off and adding trim. Cute little space usage ideas you can find on pinterest. I know I’ve seen some with little singer sewing machines. Good Luck and Congrats. That’s a great idea. I get to use 1/2 the closet in Patsy’s room for my sewing things—-but still haven’t figured out the machines. I did think of shelves in there to stack things on, or a dresser or bookshelf. The closet in that room is enormous, so 1/2 will be enough for her. The machines themselves are better left where fingers can’t fiddle with them:) So, still working on that. Becky, can I ask how many rooms your new house has? Our garden is only 0.12a and we have some fruit trees, quite some berry bushes and a nice garden for vegetables – and chicken! How exciting! I am a little jealous of those hardwood floors. I have never been a carpet person. Are you living in Salem? My son, daughter in law and two granddaughters live in Keizer. Love marion berries. I grew up in Oregon and most of my family is still there. We never get good berries in Nevada – even the ones from Calif. And never marion berries. Yum! Take care. Yes, the new house is in south Salem. I am still driving in circles a bit, with all the one-way streets in downtown Salem, but I’ll get it soon! 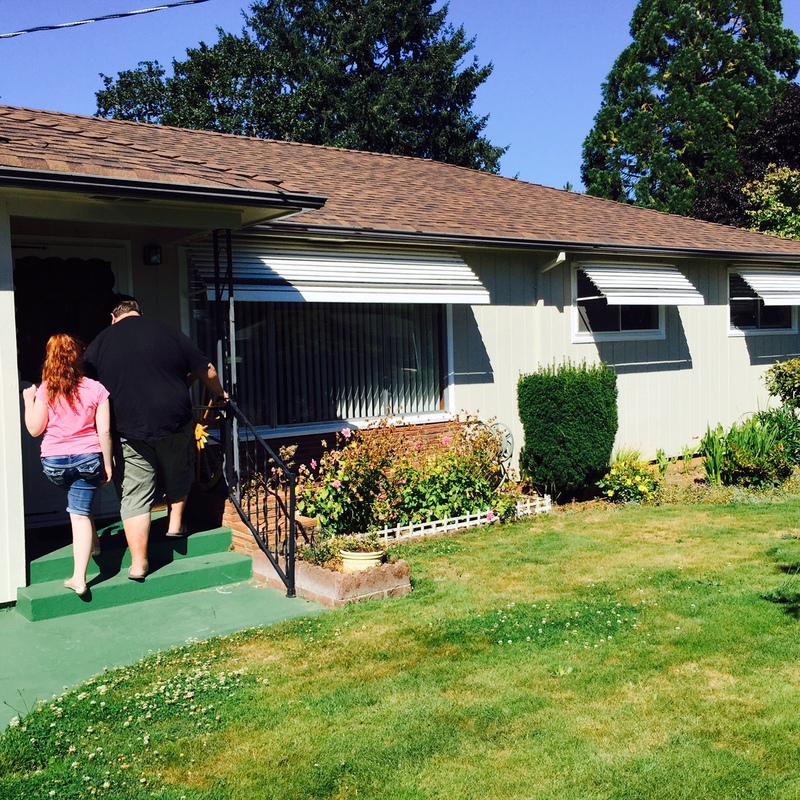 My sister and family, and aunt all live in Keizer and we looked there a lot, but could not find anything that met our needs there. Still, it’s pretty close! I am so excited for you and your family. Just the right size (no steps, level yard) with less to take care of as you get older. 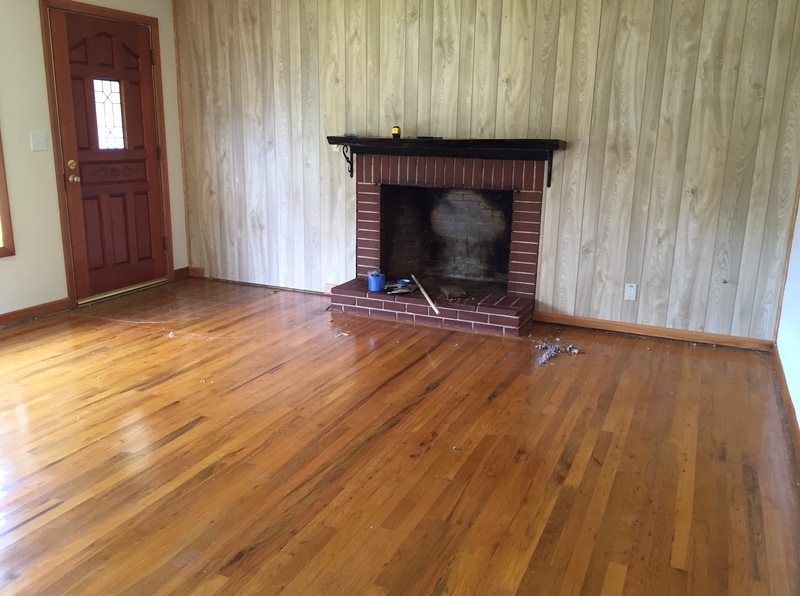 The wood floors are going to be beautiful when they are refinished. The garden area is fantastic. Maybe you can do some square foot gardening to produce more food instead of completely row gardening. I know you will be very happy in your new home! Thank you so much. We have been working down there the last couple of days and the painting is coming along! I have been reading back through your blog after reading your story. Interesting that we were moving at this same time last year. Just 4 weeks after my husband had surprise quadruple by-pass surgery! My husband has a cousin that served in ministry at one church for 20 years and he was let go in a similar way a couple of years ago. He now writes on a blog, and has done some other writing work. He also buys and sells motorcycles. His wife is a nurse and they are doing fine. It was quite a life changing event. We have realized that we really must downsize at some point in the future. Things happened so fast for us last year–my husband got a new job, we decided to move, then the surprise heart surgery….In hindsight, we should have rented and taken more time before buying a home. Our home is beautiful, but will be too large in the future and we don’t want to have a mortgage. I can’t wait to continue reading…. Quadruple by-pass surgery sounds scary, and inconvenient right before a move. That would be terrifying. I’m glad he’s ok.
Well, we don’t have to worry about this house being too big:) The nice thing is that we can afford it. So, that’s worth a lot. I’m glad you are enjoying reading. Thank you for your kind words. You have a lovely new home. I’m happy for you and your family.